A 61-year-old woman with a medical history of morbid obesity, hypertension, diabetes mellitus, and left ventricular hypertrophy presented with a palpable left upper outer quadrant triple negative (estrogen receptor-negative, progesterone receptor-negative, Her2/neu-negative, Ki-67 60%) infiltrating ductal carcinoma with measurable metastatic disease to the adrenal gland, L5 vertebral body, and sacrum. She began eribulin and denosumab for 2 cycles, which was complicated by hypertensive urgency, pulmonary edema, febrile neutropenia and renal insufficiency requiring hemodialysis. ). 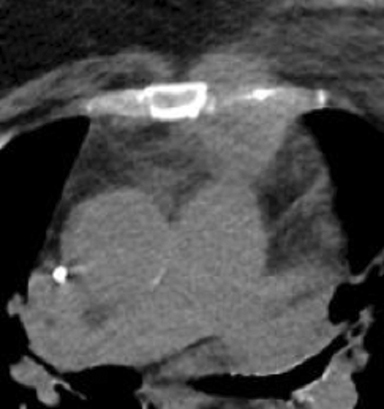 Internal mammary nodal irradiation (IMNI) was not performed due to her heart disease and palliative intent limiting the mean heart dose to 197 cGy. 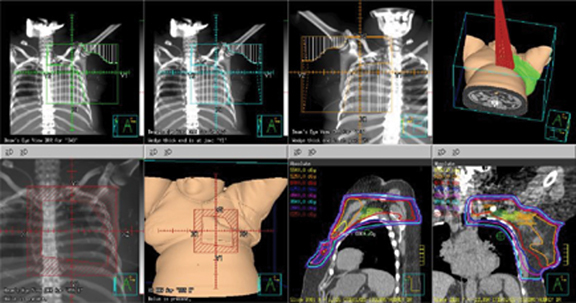 Our patient suffered an isolated internal mammary nodal (IMN) failure and was salvaged with irradiation to 55 Gy in 11 fractions using a 3-mm expansion from gross tumor volume (GTV) to planning target volume (PTV) with daily KV and cone-beam computed tomography (CBCT) for image guidance. She had no evidence of disease recurrence on her most recent imaging at 3 months post-treatment positron emission tomography/CT (PET/CT) and 6-month chest CT with contrast. ). Restaging scans 3 months after treatment showed stable disease with no FDG avidity on her PET/CT scan, and a CT chest scan 6 months later was stable. Historically, the IMNs were removed as part of the extended radical mastectomy in the hopes that more extensive surgery would be superior to the Halsted procedure, also known as a radical mastectomy. The radical mastectomy consists of removal of the entire breast, supporting pectoral muscles, and the axillary lymph nodes, while the extended radical mastectomy consists of the aforementioned procedure plus removal of the internal mammary lymph nodes. Lacour et al performed a randomized controlled trial of 1580 patients comparing extended Halsted mastectomy vs. Halsted mastectomy between 1963 and 1968 showing 5-year overall survival (OS) of 72% vs. 69%, respectively (not significant [NS]). Five of 697 (0.7%) patients in the Halsted mastectomy arm had an IMN recurrence. In the node-positive patients with inner or medial quadrant tumors, 5-year survival of 71% and 52% for the extended Halsted mastectomy and Halsted mastectomy was observed, respectively.7 Ten-year follow-up showed significantly more local recurrences in the undissected IMN group, but no difference in OS or relapse-free survival.8 Thirty-year follow-up from a similar study by Veronesi et al9 showed no survival benefit with removal of the IMNs. With no survival benefit, and increased morbidity including pneumothorax due to the intrapleural dissection required, the practice of extended radical mastectomy was largely abandoned. More recently, randomized data of IMNI has added to a growing body of literature upon which we base treatment decisions. A French randomized controlled trial published in 2013 failed to show a benefit to postmastectomy IMNI in stage I or II adenocarcinoma of the breast and either positive axillary nodes or a medial/central tumor,12 axillary lymph node status, and adjuvant therapy (chemotherapy vs. no chemotherapy although many believe the study endpoint of a 10% improvement in overall survival to be unrealistic. The MA.20 and European Organisation for the Research and Treatment of Cancer (EORTC) studies published in July 2015 in The New England Journal of Medicine evaluated the efficacy of IMNI and medial supraclavicular nodal irradiation in early stage breast cancer.13,14 MA.20 showed improved 10-year disease-free survival (DFS) (82% vs. 77%, p = 0.01) but no 10-year OS benefit.13 Subset analysis showed that patients with estrogen and progesterone receptor-negative tumors benefited more from IMNI. The EORTC study, with slightly different entry criteria (stage I, II or III with central or medial primary irrespective of axillary involvement) showed a trend toward 10-year OS benefit for IMNI (82.3% vs. 80.7%, p = 0.06), and statistically significant improvements in 10-year DFS and DDFS as well as breast cancer mortality.14 Thorsen et al stratified women with right-sided early stage node-positive breast cancer to receive radiation to the chest wall, supraclavicular, axillary and IMNI and those with left-sided disease to receive radiation to the chest wall, axilla, and supraclavicular radiation without IMNI.15 Eight-year OS was 75.9% vs. 72.2% for IMNI and no IMNI, respectively (p = 0.005). Breast cancer mortality was significantly improved in the IMNI group. This data, taken by itself, would lend to advocating for IMNI in this triple negative breast cancer case. However, given our patient’s morbid obesity, left ventricular hypertrophy (LVH), poor pulmonary function, and multiple risk factors for coronary artery disease (CAD), the risk of radiation dose to the heart and coronary vessels warranted serious consideration. In the palliative setting, it is reasonable not to treat the IMNs based on the data from Darby et al,16 which shows an increased rate of major coronary events at a rate of 7.4% per gray without an apparent threshold. While the above-noted trials mainly evaluated disease-free survival and OS as primary endpoints, in the palliative setting it may be more appropriate to consider locoregional recurrence, which could lead to pain, as noted in our patient. The Early Breast Cancer Trialists’ Collaborative Group (EBCTCG) meta-analysis evaluated 22 postmastectomy trials.17 Of the 8134 patients, 1314 had 1-3 positive lymph nodes at the time of axillary dissection, similar to our patient. The addition of radiation in this scenario decreased locoregional recurrence from 20.3% to 3.8%, and risk of any first recurrence from 45.7% to 34.2%. These decreases in local recurrence may prevent painful locoregional recurrence in our patient’s case. Our case required careful consideration regarding the risks and benefits associated with IMNI. Unfortunately, our patient suffered a painful recurrence in the IMNs just 6 months after completing palliative mastectomy and postmastectomy radiation therapy. While her initial cardiac dose was very low at a mean dose of 197 cGy, re-irradiation was challenging as we had to balance the increased risk of CAD with the local control that re-irradiation to the overlying soft tissues offered. Her symptomatic recurrence and inability to receive further systemic therapy made re-irradiation for local control and palliation of her symptoms necessary. To respect normal tissue tolerance, we used a hypofractionated course of 55 Gy in 11 fractions with a BED10 of approximately 70 Gy with daily KV and CBCT to minimize PTV margin (3 mm) and field overlap. She tolerated this treatment exceptionally well with only grade 1 fatigue and radiation dermatitis, according to Common Terminology Criteria for Adverse Events (CTCAE) version 4.0. A restaging PET/CT scan 3 months after completion of re-irradiation demonstrated no avidity in her known IMN recurrence, although longer follow-up will be necessary to evaluate the durability of treatment and long-term morbidity from treatment. This case highlights the complexity of decision-making regarding IMNI even in the setting of recently published data that is more favorable toward IMNI than more historical data. We have demonstrated that failures in the IMNs occur and, in this case, happened rapidly after initial postmastectomy radiation. However, while challenging, treatment of recurrence is possible. Further data on IMNI outcomes and methods to minimize cardiac toxicity in the setting of longer life expectancy and the utilization of cardiotoxic chemotherapy are needed to help guide nodal radiation treatment decisions in the future. Cody HS, Urban JA. Internal mammary node status: a major prognosticator in axillary node-negative breast cancer. Ann Surg Oncol. 1995;2(1):32-37. Sugg SL, Ferguson DJ, Posner MC, Heimann R. Should internal mammary nodes be sampled in the sentinel lymph node era? Ann Surg Oncol. 2000;7(3):188-192. Heuts EM, van der Ent FWC, von Meyenfeldt MF, Voogd AC. Internal mammary lymph drainage and sentinel node biopsy in breast cancer - a study on 1008 patients. Eur J Surg Oncol. 2009;35(3):252-257. Heuts EM, van der Ent FWC, Hulsewé KWE, von Meyenfeldt MF, Voogd AC. Results of tailored treatment for breast cancer patients with internal mammary lymph node metastases. The Breast. 2009;18(4):254-258. Uren RF, Howman-Giles RB, Thompson JF, et al. Mammary lymphoscintigraphy in breast cancer. J Nucl Med. 1995;36(10):1775-1780. Cox J, Spratt J, Savaridas S. Incidence and potential significance of internal mammary lymphadenopathy on computed tomography in patients with a diagnosis of primary breast cancer. Breast Cancer Basic Clin Res. 2015;9:59. Lacour J, Bucalossi P, Cacers E, et al. Radical mastectomy versus radical mastectomy plus internal mammary dissection. Five-year results of an international cooperative study. Cancer. 1976;37(1):206-214. Lacour J, Le M, Caceres E, Koszarowski T, Veronesi U, Hill C. Radical mastectomy versus radical mastectomy plus internal mammary dissection. Ten year results of an international cooperative trial in breast cancer. Cancer. 1983;51(10):1941-1943. Veronesi U, Marubini E, Mariani L, Valagussa P, Zucali R. The dissection of internal mammary nodes does not improve the survival of breast cancer patients. 30-year results of a randomised trial. Eur J Cancer. 1999;35(9):1320-1325. Bickley, Lynn; Szilagyi, Peter; Bates B. Bates’ Guide to Physical Examination and History-Taking. 11th ed. Philadelphia: Wolters Kluwer Health/Lippincott, Williams, and Wilkins; 2013. Adams FD. Physical Diagnosis. 14th ed. Baltimore: Williams and Wilkins Company; 1964. Hennequin C, Bossard N, Servagi-Vernat S, et al. Ten-Year Survival Results of a randomized trial of irradiation of internal mammary nodes after mastectomy. Int J Radiat Oncol. 2013;86(5):860-866. Whelan TJ, Olivotto IA, Parulekar WR, et al. Regional nodal irradiation in early-stage breast cancer. N Engl J Med. 2015;373(4):307-316. Poortmans PM, Collette S, Kirkove C, et al. Internal mammary and medial supraclavicular irradiation in breast cancer. N Engl J Med. 2015;373(4):317-327. Thorsen LBJ, Offersen BV, Dano H, et al. DBCG-IMN: a population-based cohort study on theeffect of internal mammary node irradiation in early node-positive breastcancer. J Clin Oncol. 2016;34(4):314-320. Darby SC, Ewertz M, McGale P, et al. Risk of ischemic heart disease in women after radiotherapy for breast cancer. N Engl J Med. 2013;36811368(14):987-998. EBCTCG (Early Breast Cancer Trialists’ Collaborative Group), McGale P, Taylor C, et al. Effect of radiotherapy after mastectomy and axillary surgery on 10-year recurrence and 20-year breast cancer mortality: meta-analysis of individual patient data for 8135 women in 22 randomised trials. Lancet. 2014;383(9935):2127-2135. Rice S, Rosenblatt P, Feigenberg S. Management of internal mammary nodal recurrence after palliative mastectomy and postoperative radiation therapy in triple negati. Appl Rad Oncol. 2017;6(4):34-36. Dr. Rice is a medical resident in radiation oncology, Dr. Rosenblatt is a medical oncologist, and Dr. Feigenberg, at the time of submission, was a radiation oncologist at the University of Maryland Medical Center, Baltimore, MD.